The portable option; the workhorse; the all-rounder. Plus: 2-inch vs 1-inch belt sanders. There is nothing imaginable that is manlier than blade smithing. Forging your own knife from chunks of metal and wood is a rite of passage into manhood in some cultures. The process is something men can tell stories about to their children. Reliable and heavy duty belt grinders are a must-have in the artistic world of knife making. Owning a dependable belt grinder for consistent output is the difference between a garbage knife and a beautiful product. It is standard to find an adequate-sized belt and a matching disc sander to meet the needs of your end knife sizes and materials you are grinding. 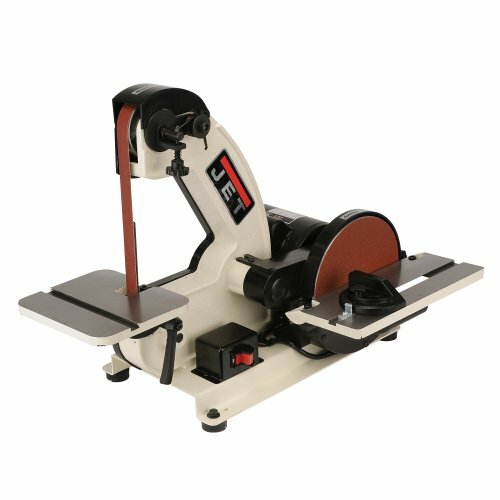 The perfect belt grinder will also serve for sharpening other tools, such as axes, circular saw blades, and gardening trowels. This article dives into some of the highest-quality belt grinders for knife making. There are many different varieties of professional-grade belt grinders. Most knife makers in the United States shape with a belt grinder instead of spending hours at their workbench with a collection of hand files. Nowadays, the only places you will find filing blade smiths are boutique custom shops and those attempting to return to older roots. Additionally, newer options have begun to creep into the market. Some of these include the Riverside Machine, Wayne Coe’s belt grinder, The Pheer327 grinder, and the TW90 model. These have started becoming more prevalent in the past three to five years. But why the overwhelming popularity of the 2” by 72” grinding belt compared to other grinder sizes? The answer lies in the commonality. As stated, over 90 percent of all belt grinding machines take the 2” by 72” belts. This makes them by far the most available and convenient belt sizes available. Additionally, size-based economy is another deciding factor. The cost for a 2” by 72” belt is about 30 percent higher than that of a competing 1” by 42” grinding belt (the second most common size found). That being the case, a 2” by 72” grinding belt is equipped with 144 square inches of grinder surface area. Meanwhile, the 1” by 42” grinder has 42 square inches of grinding surface area. So over triple the surface area for grinding for a 30 percent increase in price. Now, this does not mean that the 1” by 42” knife making belt grinders are a waste of money and time. Many professional knife makers have both options available in their workshops. The 1” by 42” grinders work extremely well for detail work and knife sharpening. As long as the buyer obtains a smaller belt grinder with a high-quality work table and platen, and a strong enough motor, the 1” by 42” should work fine. We will now dive deeper into each of these three to tease out the features, pros and cons, and general opinions on these alternative belt grinders. The Grizzly H6070 is incredibly versatile. The grinder also performs contour sanding, dry sharpening, and intricate part sanding. 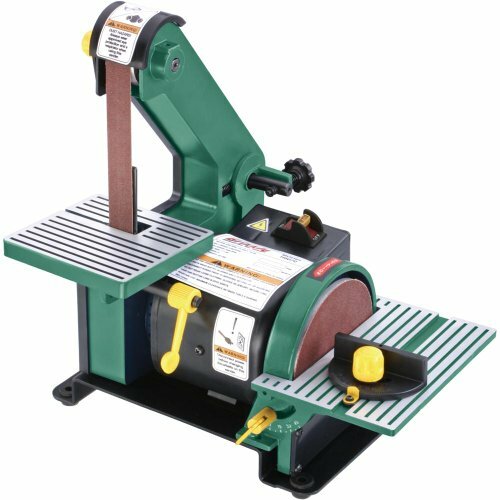 The grinder product combines the bench top sander with a one-inch by 30-inch belt sander. Grizzly’s flagship “mobile model” also includes a five-inch disk sander, all in one convenient, portable machine. Both the disk sanding table and the grinding belt tilt up to an impressive 45 degrees. This allows the user a wide range of versatility for their knife making. Due to the Grizzly H6070’s idle roller guard and removable belt platen, contour sanding is a quick, simple, and painless process. The Grizzly H6070 comes with an impressive 1/3 horsepower motor powered at a single phase 3450 revolutions per minute at 100 volts. This is almost twice as fast as the other two products reviewed. Additionally, this mobile belt grinder comes with direct drive and a tracking adjustor. The Grizzly H6070 comes with dual 1.75-inch dust ports. As stated, it utilizes a five-inch PSA disk, as well as standard one-inch by 30” grinding belts. The grinding belts on the machine are relatively simple to switch out. The process starts by releasing the tension to remove the old grinding belt, and finishes with placing the new one in the same position. The five-inch PSA disks can be more of a challenge to remove. This is due to the adhesive backing. Most pros do not note this as a major pain point. The Grizzly H6070 is an ideal belt grinding machine for those looking to get into knife making for the first time. The machine won’t stop and choke with extended usage or when the belt is pressed to hard. The machine has an incredibly powerful motor for its size, yet remains quiet when used. If you are facing space constraints you'll love the H6070's compact footprint. The Grizzly's compact frame shows no relative sacrifice of power, though. The above-mentioned features make the 1SM a true powerhouse for blade smithing and knife development. 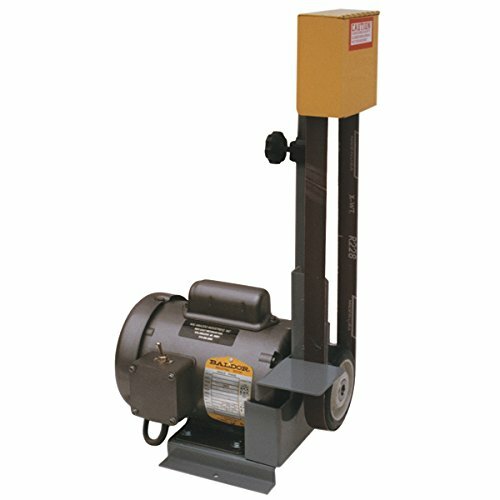 The belt grinder also works wonderfully on composite materials, wood, and even plastic. The 1SM can also be utilized as a portable sander (like the Grizzly H6070 reviewed above) or bolted onto a solid table top for heavy-duty working. Spring-tensioned rollers allow users a consistent tension, with the added benefit of tracking. Besides standard blade making, the Kalamazoo 1SM’s 42-inch grinding belt allows owners to sharpen a multitude of tools. Unlike the Grizzly, the grinding belt is included with the initial sale. When belt changing is needed, the 1SM’s ease of use makes replacement a thirty second process. The Kalamazoo 1SM’s adjustable tilting table and rest for tools being shaped is a svelte three inches square. Despite the minute frame, the machine weighs in at a hefty 32 pounds, making it ideal for projects requiring a lot of stability and movement. Almost all online reviews of the Kalamazoo 1SM give it top marks, making it one of the highest rated belt grinding machines on the market, and we're more than happy to add our voice to the choir. The American-built one-third horsepower motor is sealed to prevent dust from entering components. A fan-cooled machine, the 1SM has adequate power for any smaller knife-making tasks. For larger blades such as machetes or swords, though, we highly suggest a larger-width belt. The included grinding belt is 100-grit, and abrasive enough to ensure quick work is made of any knife making tasks. Vibrations are insignificant due to the dense nature of the machine. The Kalamazoo is 12 pounds heavier than the Grizzly alternative reviewed above. Thus, reported noise levels are far lower than competing products in the one-inch grinding machine market. The aptly-named JET J-4002 belt grinder takes one-inch belt sanding to a level unmatched by the Kalamazoo and Grizzly options. For those with deep pockets, the power take off on the JET model allows owners to mount a flex shaft. This addition can turn the grinder into a drum sander, carver, or deburring device. The highly-abrasive sander is multi-functional, performing tasks as a coping saw, jig saw, and even hand file. The JET J-4002 removes high levels of excess material, while performing finishing touches on blades and tools in one combined step. Users have found it allows them to reach smaller spaces with the thinner belt. Additionally, the JET model works for precision angle handling and grinding of odd shaped blades. Its professional-grade miter gauge is lockable and turn-capable at up to 45-degree angles both left and right. The machine arrives installed with a one-inch by 42-inch grinding belt, and a large eight-inch wheel. The dimensions of the JET J-4002 is 21 inches by 22 inches by 14 inches, making it far larger than both the Grizzly and Kalamazoo. The product has a top grinding belt speed of 3,000 feet per minute, and the belt mechanism handles speeds even higher than this. The JET is built to last with high quality reliable engineering specs, which shine through in its durability. The J-4002 has been tested to meet and exceed tight standards of tolerance to ensure that owners are receiving endless high quality. We love the JET J-4002's setup and takedown simplicity. This makes it a highly portable machine, despite its hefty weight (twice that of the Kalamazoo, and three times that of the Grizzly model). The machine is heavy-duty, and was developed to last through extended, repetitive use. Models are currently being used in high-flow environments such as machine shops and shop classes. Sometimes these machines are switched on and running for eight hours per day, several days per week. The JET J-4002 works ideally for a variety of knife making tasks. The impressive power still allows the machine to run quiet in comparison to similarly-sized wider belt grinders. Machine owners mention that they have begun transferring tasks that were reserved for the two-inch grinders to the JET model. These owners claim it to be a true one-stop shop for all things knife making and belt grinding, and that certainly fits with our experience.